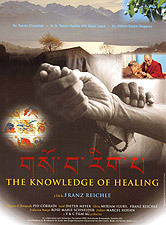 The first feature documentary dealing extensively with Tibetan medicine, one of the most highly developed medical systems, THE KNOWLEDGE OF HEALING presents evidence that deserves serious consideration as a supplement to Western medical technology. The original Tibetan book of medicine - the Gyüschi (knowledge of healing) - dates back to the 12th century. The medications used comprise herbs, roots, minerals, etc. Successes have been achieved with chronic sicknesses that, in the West, are regarded as incurable. Instead of being based on biochemistry, Tibetan medical thinking, which is strongly rooted in Buddhist principles, views the human body as governed by an elaborately organized and codified system of energies flowing through a system of channels. Its practice has been taught over last four centuries in Tibetan medical schools, most of which were destroyed by the Chinese in the late 1950's and early 60's. The few Tibetan physicians who weren't executed went into exile. Some of them reestablished themselves in Dharamsala, in northern India. The film introduces Tenzin Choedrak, a leading Tibetan medical authority, and shows him treating the 14th Dalai Lama for a minor ailment. The Dalai Lama himself appears twice in the film to argue forcefully for the acceptance of Tibetan medicine as a valuable addition to the Western system. The film begins with a brief outline of the principles of Tibetan medicine and goes on to show physicians in Dharamasala and in Buryatia (part of Siberian Russia) treating patients with a variety of ailments. Although there are no overnight miracle cures, the Buryat center claims a remarkably high cure rate for radiation-related ailments associated with the 1986 nuclear accident at Chernobyl. After visiting these centers and observing diagnosis and treatment of patients suffering from everything from partial paralysis to the traumas of torture, the film moves westward to research centers in Israel and Switzerland where clinical studies are being conducted and several Tibetan medications industrially manufactured. The researchers have discovered that the Tibetan remedies work (the most remarkable testimony comes from a man whose heart disease was so advanced that a bypass operation wouldn't have helped him and whose clogged arteries were unblocked by a Tibetan medication), although the actual chemical processes by which they heal remains largely mysterious. THE KNOWLEDGE OF HEALING is not propaganda for alternative medicine, but a thorough, objective examination of an ancient interpretation of human physiology, and an investigation into an amazingly succesful method of healing. Angry Monk: Gendun Choephel, a legendary figure in Tibet, turned from the monastic life he was born to (as the reincarnation of a Buddhist lama), to become a fierce critic of his country's religious conservatism and isolationism. Old Dog: A family on the Himalayan plains discovers their dog is worth a fortune, but selling it comes at a terrible price. Paths of the Soul: An astonishing journey of redemption, faith, and devotion, following a group of villagers who leave their families and homes to make a Buddhist "bowing pilgrimage" to the holy capital of Tibet. Tharlo: Tibetan director Pema Tseden adapts his own novella about the story of a Tibetan shepherd's encounter with the big city.